Today’s post is a whopper, so fetch yourself a cup of tea (if you’re British) or a coffee (if you’re Italian). Everyone else can grab a beer (and if you don’t drink then I’m sorry). 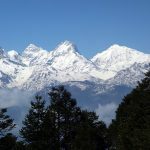 I’ve known for a long time that Nepal is a land of contrasts – from the jungle lowlands in the south, to the terraced farmland of the cultivated middle hills, to the towering snowcaps of the Himalayas in the north. From the madness, pollution and crowds of Kathmandu, you can climb up into the hills and witness the peace and tranquillity of the Himalayas the same day, a change of mood that has few parallels. We experienced one of these dramatic mood swings later in our trek, where things changed from beauty to despair in a single day – but more about that later. I’ve been meaning to go to Langtang for a long time. It was Nepal’s third most popular trekking destination after the Khumbu (Everest) and Annapurna regions. This changed very suddenly in 2015. The Langtang Valley suffered doubly during the 7.8-magnitude earthquake that year, when a huge landslide (I hesitate to call it an avalanche) of rock, ice and snow fell off the south side of 7,227m Langtang Lirung, the mountain that dominates the valley. Hundreds were killed in the landslide, and many homes and livelihoods were ruined – temporarily. Trails were also destroyed, and the area was closed to trekking for a time after the tragedy, but things are slowly picking up again. The trails have been repaired and teahouses are open. It’s now possible to trek in Langtang in the same way as in the past, but I’m told it’s much quieter than it was. I also found the teahouses more basic than those in the Khumbu or Annapurna regions, but as this was my first time in Langtang I don’t know whether this was also true before the earthquake. The reason I ended up in Langtang this time around, on my twelfth visit to Nepal, was more an accident of timing than anything else. I happened to have time off in March, a period when spring is arriving at lower altitudes in the Himalayas, but it’s still very much winter higher up. This poses a problem for trekking in some areas where passes are still closed, and for mountaineering everywhere because the peaks are much more difficult. 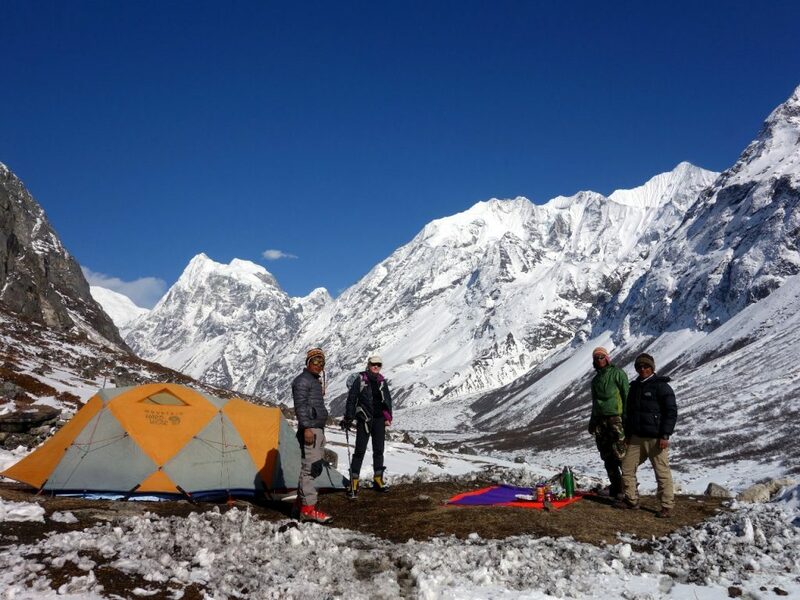 We chose Langtang because we believed the passes would be accessible, and the trekking peaks would not be too difficult. We proved to be wrong on both counts, and this in itself provided another example of Nepal’s contrasts, when the purpose of our trip changed from mountaineering to exploratory trekking. The trekking also contained contrasts. To get to Langtang it was necessary to pass through the Helambu region immediately north of Kathmandu. 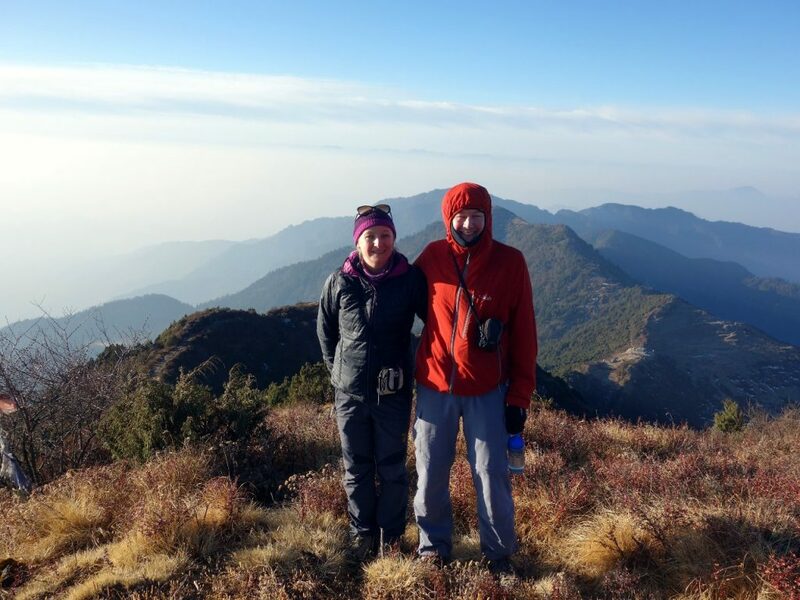 Trekking in Helambu essentially involves walking along ridges, while Langtang involves valley walking (the ‘ridges’ in Langtang are 6,000 to 7,000m mountains on either side). In between the two we crossed over a high pass through Gosainkund, an area of frozen lakes (which weren’t frozen when I passed that way in summer ten years ago). It’s possible to get the bus from Kathmandu to Sundarijal, a town on the outskirts of the city, and start trekking straight away by entering Shivapuri National Park, an area of forested hills immediately north of the city. We cheated and saved ourselves a day of trekking by taking a jeep through Shivapuri to Chisapani, the first village on the Helambu trail. The drive took about three hours, and the road was so rough we go tossed like pancakes in the back seat, a treat our driver described as a ‘Nepali massage’. There were four of us: myself, Edita, our climbing guide Gombu, and our porter Sangye, who as well as being immensely strong, actually did most of the leading and spoke reasonable English. We had arranged the logistics through Jamie McGuinness and his company Project Himalaya. The local Nepali operator was called Expedition Himalaya. There was evidence of earthquake damage as soon as we reached Chisapani. A red four-storey teahouse at the top of the hill was slanting at a 30 degree angle. It looked ready to topple into the house next door and should really be knocked down, but I guess it will probably remain that way until it subsides naturally. This was a notable feature of the first few days. While Langtang received lots of attention as a casualty of the earthquake, Helambu was almost as badly affected, and evidence of destruction was everywhere. Helambu was interesting trekking for me. Ten years ago I trekked the same ridge in reverse during June. The monsoon had just broken, and my enduring memories were of rain (lots of it) and leeches. I was basically walking through a thick grey cloud for three days, with the same views you’d expect from inside a cloud. This time we had great weather, and I was able to appreciate what I missed last time. The ridge is broad – wide enough to accommodate villages, thick forest and open meadows. The trail weaves along it, sometimes looking to the east, sometimes to the west, and sometimes the ridge narrows to give views on both sides. And when the view opened to the right, the snowcapped spires of Ganchenpo and Langshisa Ri, and the broader Dorje Lakpa were visible up ahead. 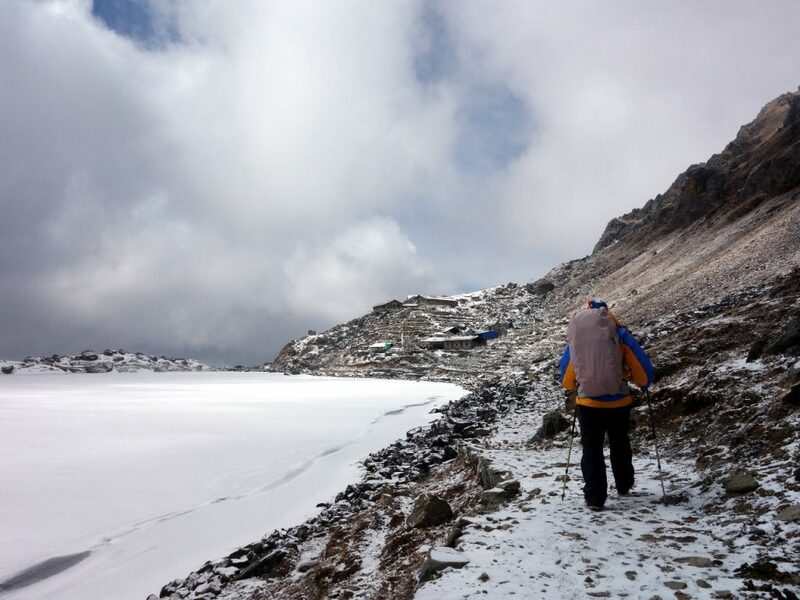 It took four days to walk through Helambu and over the Laurebina Pass into the Langtang region. On the first day we were never far from civilisation as the trail passed through many villages. The one I remember most vividly was Gul Bhanjyang. I remembered it as one of the poorer villages when I passed in 2007, and it fared badly in the 2015 earthquake. The narrow main street had been completely destroyed, and many tin shacks have been erected below the ridge as temporary accommodation. Temporary they may be, but they are still there and being lived in two years later, and few of the original stone houses have been rebuilt. The ridge is bare and narrow of trees here, and the setting is immense, with wide views of the countryside east and west, but the village was otherwise a shantytown. There were no tourist teahouses there, so we stopped in a locals’ teahouse, where Sangye made us egg noodles and coffee, and we chatted to some of the villagers. One was a teacher at the school here, a single narrow building fifty metres long that accommodates 400 pupils. The kids come from surrounding villages up to two hours’ walk away. Sangye’s meal was good, and the whole thing – food and drink – cost only 230 rupees (about $2.30) for two of us. We enjoyed talking to the local travellers, but it was the only time we ate in such a place. We stayed that night in Kutumsang, the most northerly village on the Helambu trail. Beyond Kutumsang there were only teahouses, and no more villages until we crossed the pass into Gosainkund. We entered the national park that day, and spent most of it climbing through thick forest of pine and rhododendron. One of the great advantages of trekking in the Himalayas in March is that the rhododendrons are in flower, and the trees are colourful with pink, red and white blooms. Around this time of year in the UK our forests are alive with bluebells, and the Himalayan equivalent is the primula, whose purples rosettes dappled every bank. I had bad memories of Tharepati, the community of teahouses where we stayed the following night. There are three teahouses there, and the one we chose ten years ago was the worst teahouse I have ever stayed in. The roof leaked in my room, and it was being run by teenagers whose main form of entertainment was to make crude jokes with the guests. I vowed never to stay there again (it’s the one at the bottom, if you’re interested). One of the other two had been destroyed in the earthquake, so we had no choice but to go to the third. It was very comfortable, with a cosy dining room decorated with woolly Tibetan hats knitted by the lady owner. Another thing I didn’t know about Tharepati is that its setting is lovely, perched above the forest at the top of the ridge. Half an hour’s walk above it is a notable viewpoint known as Helambu Hill where you can look south across a line of forested hills all the way back to Shivapuri Peak, which rises above Kathmandu. We got up early and walked up there the next morning. I had no idea it was like this. When you’re walking through thick cloud during the monsoon, you miss out on a lot of stuff and get leeches in return. Later that day we traversed beneath the ridge back into forest (bamboo this time), to install ourselves in the teahouse at a place called Phedi (which means foot). This was the starting point for crossing the Laurebina La into Gosainkund the following day. Without waiting for an answer, he turned and left. ‘If he’d given me time to respond I would have asked him about Marine Le Pen,’ I said to Edita a few moments later. I was joking. I wouldn’t really have asked him about Marine Le Pen. That would have been impertinent, but Edita is never one to miss an opportunity like that. Of course, we were quicker than him, and later that afternoon we overtook him on the trail while he was taking a rest. ‘He wants to ask you something,’ Edita said to the Frenchman (in French), pointing at me. She asked him for me. He looked at the sky and threw his hands in the air. ‘Le monde est fou!’ he said. My French isn’t great, but I didn’t have any trouble understanding that one. We shook hands, and Anglo-French relations were restored … at least until they elect Marine Le Pen. Phedi was also notable for an unpleasant incident later that evening when I went to the outdoor toilet in the darkness just before I went to bed. I squatted down to begin proceedings when I felt something fall out of my jacket pocket and land with a splosh. I didn’t know what it was, but I was very unhappy when I returned to the room and couldn’t find my toothbrush. Despite making my mood clear by treating our Gallic friend in the room next door to some choice English profanities through the plywood partition, Edita still found the whole incident hilarious. She made up for this by finding my toothbrush somewhere safe the following morning. We’d had beautiful weather until Phedi, but for pretty much the entire trip thereafter, the weather was governed by sod’s law. When we woke up the following morning the sky was grey and there was a fresh carpet of snow on the ground. We walked up to the 4,610m Laurebina La in a black and white world. At the pass the wind was howling into our faces. The holy lake of Gosainkund was completely frozen. In the summer there is a Hindu festival and thousands of pilgrims bathe in its waters. Today even brass monkeys wouldn’t want to take that risk. We did find a cosy teahouse though, with homely Tibetan décor in the dining room, of prayer flags, posters, paper marigolds and knitted Tibetan hats. In the evening we sat around the fire sipping Khukri Rum, and the lady told us about the earthquake. The teahouse survived because the walls were made from a double layer of stone on the outside and wood inside. While the stone all came down, the wooden interior remained intact. The next day we descended from Gosainkund to Shin Gompa, and the weather was comically dreadful. It was the second day of the snowstorms that were to plague the next week and eventually defeat our climbing plans. We descended to Laurebina into the teeth of a blizzard. Visibility was just a few metres, and I was impressed Sangye was able to find the trail. It was completely covered in fresh snow and he descended in zigzags. In alternate stages we zigged at right angles to the wind, then zagged directly into it, leaning forward as though shouldering a door open. I’ve never been to Antarctica, but it was kind of how I imagine it. There are no teahouses in Antarctica though, and that’s where Langtang has advantages. The higher of the two teahouses at Laurebina is extremely basic, little more than a rickety shed. To us it appeared out of the mist like the Ritz. We didn’t know whether it would be open, and when a husband, wife and two teenage children saw us come through the door they looked as surprised to see us as you might be if aliens landed on your front lawn. The hundred rupees I spent on a mug of black tea were some of the best rupees I’ve spent. We sheltered there for half an hour and stayed away from the windows for fear the howling wind would make them explode. It’s lucky I didn’t need anything more than a pee, for when I went to the toilet the water in the bowl was frozen and covered in a layer of snow. The family told us they had never known it so windy up there. We were only twenty minutes above the treeline, where it might be more sheltered, but Gombu was worried we might be knocked unconscious by falling branches. Eventually there was a lull, and we took our chances to descend further. Snow was thick on the trail below Laurebina, but luckily the forest did indeed provide shelter from the gale. We stopped for lunch in the village of Shin Gompa, then in the afternoon we left the snow behind to descend to Thulo Syaphru, high above the Langtang Valley, but 2,000m lower than where we had started the morning in Gosainkund. The snow had now turned to rain and the trail was muddy. 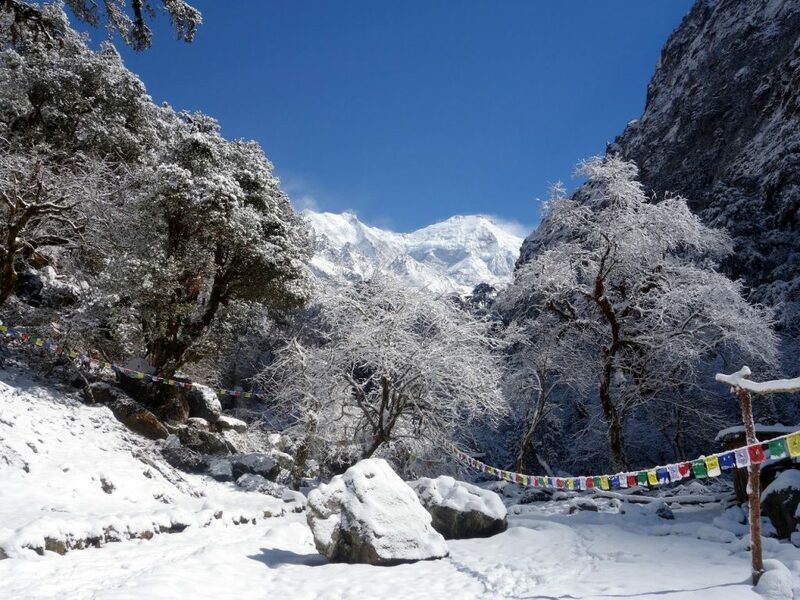 The next day was our first in the Langtang Valley, which is a narrow, forested gorge in its lower reaches. It rained all day, but to cheer ourselves up we stopped for morning coffee at a teahouse above the river and treated ourselves to quarter of a chocolate cake each. We met our porters and kitchen crew for the rest of the trek there as well. It’s not difficult to understand why the Langtang Valley was a dangerous place in the immediate aftermath of the earthquake. The valley is narrow and steep-sided, with sheer cliffs rising from ground level. There is much loose rock, and I imagine landslides and rockfall were common even before the earthquake. There were many aftershocks following the initial tremor, and each one of these would have posed the risk of another landslide. The narrowness of the valley in its lower section means there are no parts in the middle that are safe from rockfall. 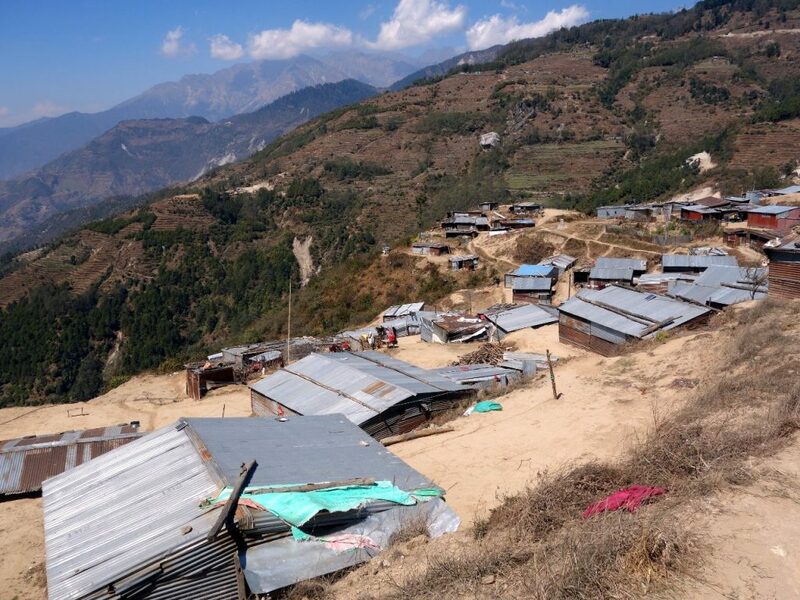 To put it simply, there is danger everywhere until you reach the village of Mundu, a short distance above Langtang village, where the valley broadens. We stayed a night in Lama Hotel, now a village but presumably once a single teahouse. Here we met trekkers on their way down who told us they had to break trail through knee-deep snow. This wasn’t up a mountain, but on the main route through the valley. The snow gave a Christmas card feel to our morning walk the following day as we passed through forests, their trees laden with hanging branches dusted with icing sugar. In the afternoon the snow was more deceptive as we climbed above the forest. As the sun beat down the snow began to melt into slush and the trail became a running river. But the snow hid the worst ravages of the earthquake. We were passing through an area of devastation, but for much of the time we didn’t know it. On the opposite side of the valley we could see that the trees had been toppled like dominoes. When the massive rockfall came down from Langtang Lirung and buried Langtang village, it produced a gust of wind the force of a hurricane. This wind swept down the valley, cutting every tree like a scythe through corn. We could see this plainly enough, but on this part of the trail there are many ruined buildings that today were buried under snow. Even when we reached the former site of Langtang village, it was hard to see much evidence of the landslide. We were stunned when we returned the following week after the snow had melted. The devastation was shocking and unbelievable. There were two things the snow couldn’t hide. Back in Kathmandu it’s widely known that a single house survived the landslide in Langtang. This house sits tight up against the cliff face in a small alcove almost like a cave. One corner has partially collapsed and it now stands deserted like a haunted house, an eerie reminder of an event so powerful it could have been supernatural. 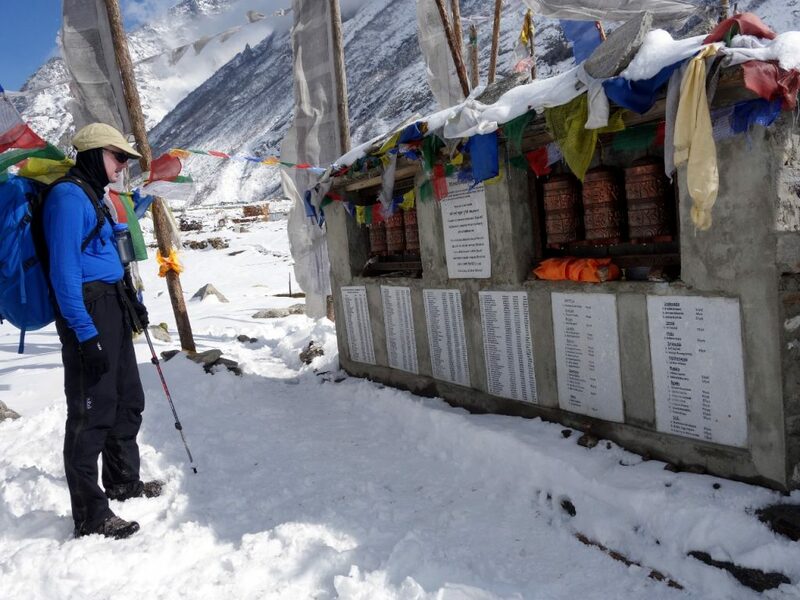 There is also a memorial mani wall with plaques listing the names of every person who died in the tragedy – 175 villagers, 27 local guides/porters and 41 foreign trekkers from 15 different countries. The earthquake in Langtang was an international tragedy. It wasn’t until eight days later, when the snow had melted, that we were able to fully appreciate the scale of the event that caused it. After a few moments of reflection we passed on and stayed for a night in a new teahouse a few metres away. They are slowly rebuilding Langtang village about 100m higher up the valley. The old village was right beneath a giant couloir, which quite clearly channelled all the rock and ice from Langtang Lirung straight down onto the houses like a funnel. The new village is beneath cliffs, a little above the couloir. It’s probably safer, but you wouldn’t describe it as safe. That night was a difficult one for Edita. She had been at Everest Base Camp when the earthquake struck in 2015. Events there were almost parallel, if on a smaller scale, when a giant landslide came off Pumori and wiped out most of the camp. Nineteen people died and there were many more survivors than in Langtang, but she was stuck there for a few days afterwards with aftershocks continuing. It didn’t feel safe to remain and it was a traumatic experience. In Langtang village she slept fully clad so that she could run outside in the event of another earthquake. By contrast I would have to run out into the snow in just my Crocs and underpants, which would probably be as much a shock for others as for myself. We left much of this trauma behind the following day as we moved up to Kjanjin Gompa. Above Langtang village the valley flattens out and becomes much broader. Kjanjin Gompa (which has a small gompa or monastery, but is actually a large community of teahouses) sits in a wide plain at the junction of a glaciated side valley. The gompa itself took some damage, but the village was safe from the landslides which plagued villages further down. At 3850m it is the highest village in the Langtang Valley, and there are no more teahouses beyond. We stayed in Kjanjin Gompa for four nights in total, with one night of camping in between when we headed off to climb Yala Peak. The village was beset by snow. When we first arrived at the teahouse a Moldovan trekker and his guide were preparing to leave. They both had horribly weatherbeaten faces with lips like crocodile skin and panda-style sunburn masks where their eyes had been protected by sunglasses. Serious mountaineers, I thought to myself, I wonder which mountain they’ve been up. I had a chat with the Moldovan, who actually lived in Dublin and had a comedy accent that was clearly Eastern European apart from a few phrases when he burst into broad Irish. He told me they had only gone for a modest acclimatisation hike on 4984m Tserko Ri. It’s normally a short three or four hour walk, but on this occasion there was so much snow that it turned into an epic. He showed me a video on his phone, of his guide wading through chest-deep powder snow. It looked like some Saturday-night game show on BBC1. He said it took them nine hours and they had to abandon the hike well short of the summit. They returned to the teahouse at 8pm. We fared a little better on our acclimatisation hike up 4601m Kjanjin Peak the following day, with Sangye breaking trail. 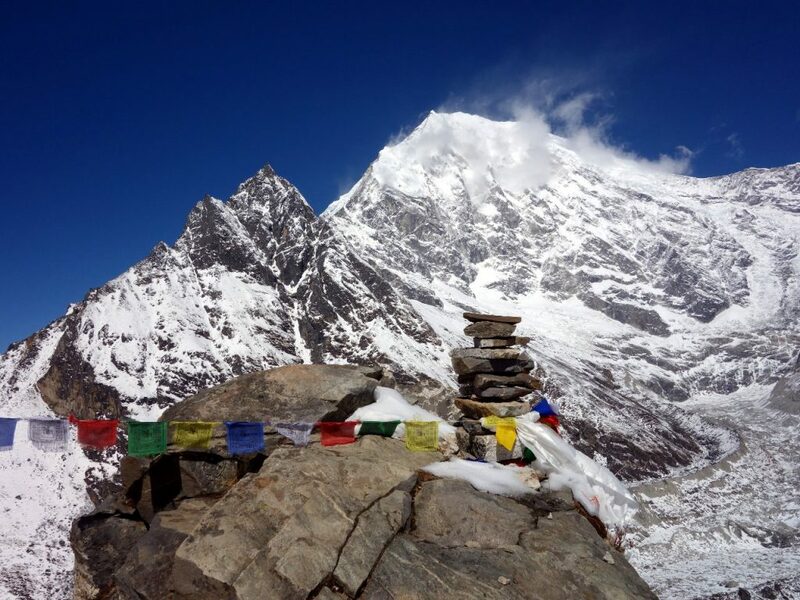 Rising directly above the village, there is a small shoulder (Kjanjin Ri) at 4337m, with a cairn and a few prayer flags. This is where most people stop for photos. But there is a long and gentle ridge beyond which leads up to the main peak. It was windy up there but the view from the top gave us a good opportunity to understand the local geography. Pyramidal Langtang Lirung (7227m) is clearly the dominant peak in that part of the valley, but rising above the north end of Kjanjin Gompa’s side valley, 6264m Yubra also looked an impressive wall of rock and ice. This is another of the so-called trekking peaks that have been badly classified. It’s a mountain for serious climbers only. On the south side of the valley another trekking peak, 5863m Naya Kang was the highest in a short line of smaller peaks, all of which would be good mountains to classify as trekking peaks if anyone in Nepal bothered to take on the job of classifying these things seriously. It rises above a high pass, the Ganja La, which was to be our route back into Helambu on our way back to Kathmandu. We intended to climb Naya Kang too, and it looked more difficult than I anticipated. We left Kjanjin Gompa for two days to go and climb 5530m Yala Peak. To get to base camp we needed to traverse around the south side of Tserko Ri, the peak that had troubled our Moldovan friend. This normally straightforward day was a long and difficult one for our porters. There is normally a clear path round the peak, but it was hidden under deep snow. We therefore needed to traverse steep snow slopes for almost the entire day, breaking trail as we went along, with a big drop below. It was tiring and took much longer than we expected. On the other side of Tserko Ri we turned north up a side valley. Here the trail descended to the valley floor, no longer a steep traverse, but our legs kept disappearing into gaps between rocks. This was not only exhausting, but for the porters it carried a risk of injury. They wanted to stop short of base camp, leaving us a few hundred extra metres to climb on our summit attempt. I could see that if I kept to a ridge ahead of us the route would be free from these ‘rock crevasses’ that the porters were having difficulty with. I set off up it in zigzags without looking back, and luckily everyone followed me. This bought us an extra hundred metres or so, but our cook Bire caught up with me at some abandoned stone shelters, and asked if we could stop and break camp. He wanted to get settled before the afternoon was too advanced. Yala Peak had been hidden behind Tserko Ri, but now we could see it rising above a series of gentle hillsides. It’s actually a series of peaks rising along ridge, the one on the right being the highest. Despite the deep snow elsewhere, I was surprised to see that much of it was rock. There was a distinctive line across it dividing lighter and darker rock. The upper part of the mountain was a yellowish colour, reminding me of the Yellow Band on Everest. On Everest this band is formed of marble (the summit is limestone), but my geology isn’t good enough to tell you the rock types on Yala Peak. Our slightly lower camp was at 4650m, leaving us 900m to climb on our summit day. This was 150m short of the normal location of base camp. 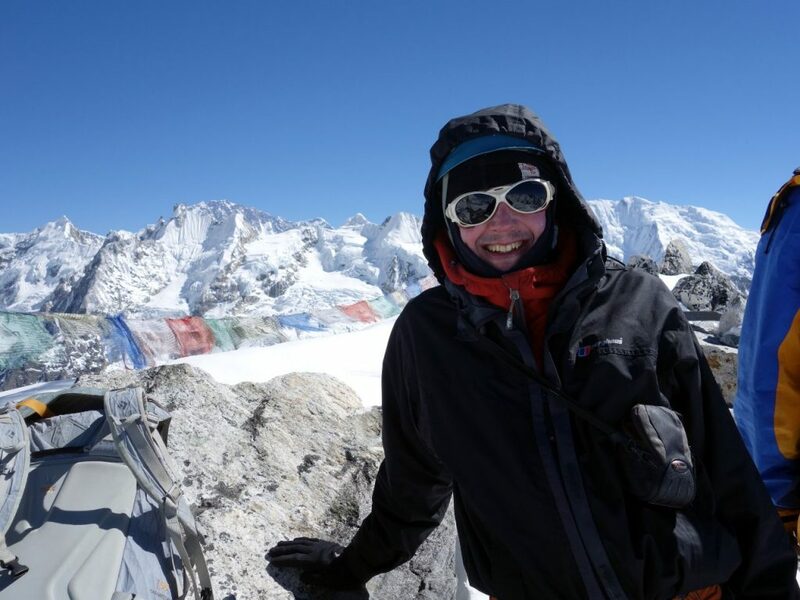 Despite Yala Peak looking like a rock peak, we knew this was deceptive, and there would still be lots of fresh snow, so we made an early start at 2.30am. Gombu was the climbing guide, but again the younger and stronger Sangye did most of the leading. Above camp we entered a high amphitheatre, bounded by Langtang Lirung, Yubra, and the pleasing colours of Yala Peak to the right. The first few hours till dawn involved tramping up gentle and featureless snow slopes. It became very cold, and Edita and I both had problems with cold fingers and toes. Eventually I had to stop and put my down mitts on, which I always carry on a summit day for just such an eventuality. I’m told that on a normal day Yala Peak is just a rock scramble, but today wasn’t a normal day. After ascending the snow slopes to reach its base, the next part of the ascent involved scrambling up loose rocks. A short chimney brought us onto a sloping platform that girdled Yala Peak beneath its final rock tower. We ascended it in two giant zigzags. All of this section was buried under thick snow. It was hazardous terrain, and we were constantly putting our legs through gaps in the rock. By 8 o’clock we had traversed beneath Yala Peak’s summit rock tower, and were ready for the final climb up its south ridge. Gombu took a rope up a steeper rock scramble and fixed it at the top for us to come up on. We were now just 20m below the summit, but there was a little more work to do. A knife edge snow ridge and a wall of snow, led onto the summit dome. Gombu again went first and fixed a rope for us. I was surprised when I followed him up and found that at the top of the rope we were standing on the summit. It was 9.30 by then. Edita came up next, then Sangye. At 5530m Yala Peak is not a high mountain by Himalayan standards, but the ending was special. 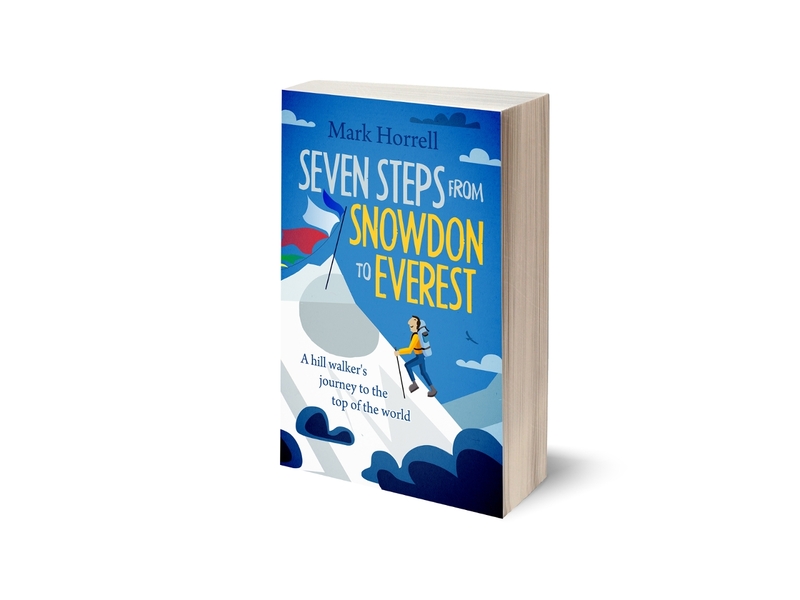 It was as distinct a summit as any other I’ve climbed, and it’s a fabulous viewpoint, surrounded by snow peaks of all shapes and sizes, divided by sweeping glaciers. 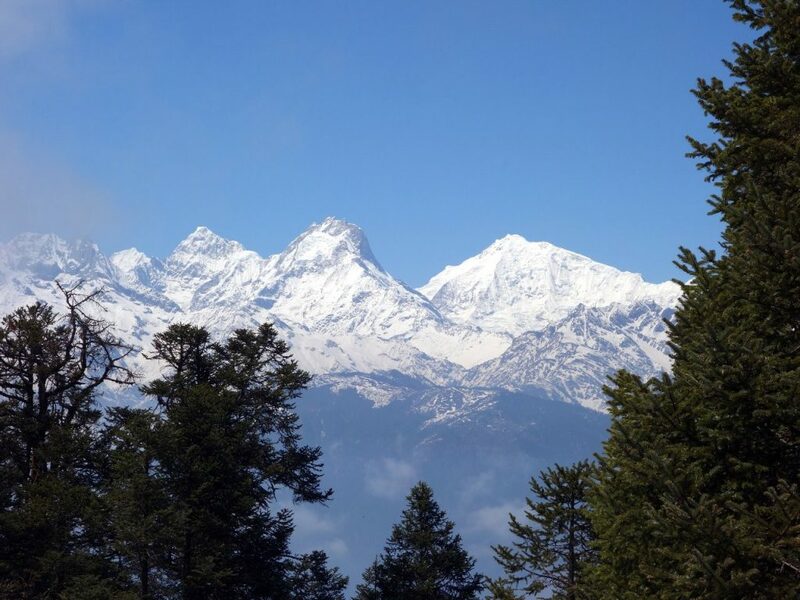 We could see much more of Naya Kang’s ridge stretching far to the east, and containing the higher peaks of Ganchenpo, Langshisa Ri and Dorje Lakpa. Our view of Langtang Lirung and Yubra was essentially the same as we’d seen before, but we had a new vista to the northeast, and it contained a real treat. We looked across a glacier to a high and narrow snow ridge. Beyond it a huge mountain peeped up, displaying a rock face that made Yubra’s look piddling. 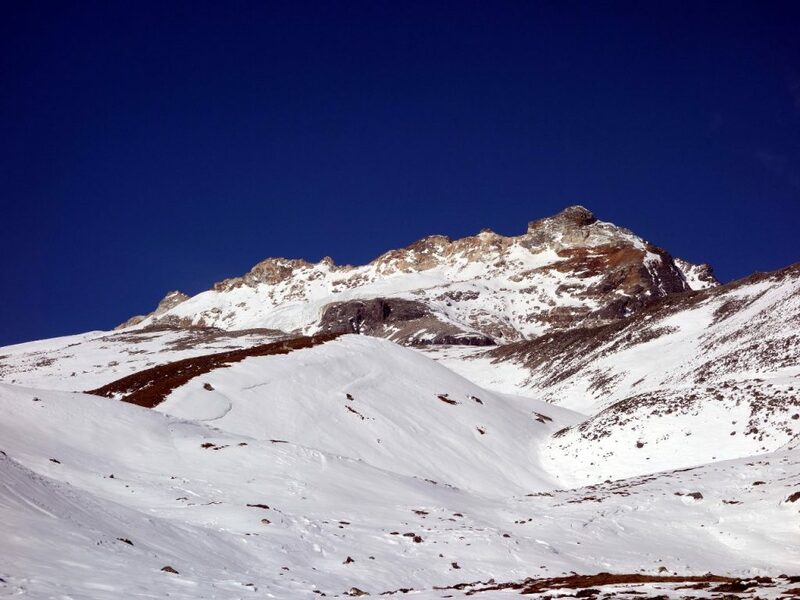 It was the south face of Shishapangma. It was the closest I have been to the world’s fourteenth highest mountain, and the last of the 8000m peaks. Within this high-altitude wonderland with its base set at 4000m, the narrow Langtang Valley that we ascended stood out as a tiny plughole disappearing into the bowels of the earth. It was a view that I will never forget. The day was still young, but I won’t bore you with the rest of it. We chose to return to Kjanjin Gompa that day, so after returning to our base camp, we packed up and continued round Tserko Ri. The snow had hardly melted, but at least we still had yesterday’s footprints to ease our passage. We returned in cloud and arrived back in Kjanjin Gompa at around 5.30, after a fifteen-hour day. At this point our plans changed dramatically. We had intended to climb up to the Ganja La pass the following day, ascend two peaks, then continue into Helambu. 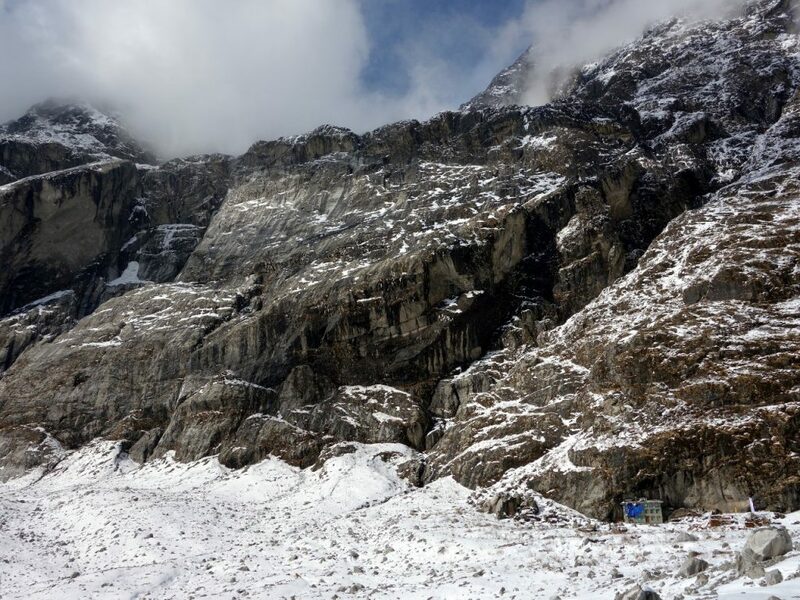 But the deep snow and hazardous ‘rock crevasses’ meant that our porters wouldn’t be able to make it up to the pass. This effectively killed off our chances of going over it, and we would therefore have to return down the Langtang Valley. We also needed some dry days to consolidate the snow on Naya Kang, or the slopes would be too dangerous. But it snowed again that night and much of the next day. We decided to give up on the two peaks we had planned, and spend six days exploratory trekking instead. We had six porters, a cook, and a week’s supply of food, so essentially the map was ours to explore. We continued up the Langtang Valley to Numthang, and spent two nights camping in a kharka (summer grazing ground) called Chyadang. We were the only people there, and at last our trek had a feeling of remoteness. 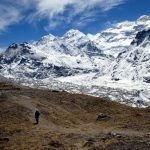 The snow had turned the valley into a winter wonderland, and the peaks at the top end of the valley – 6865m Pemthang Karpo Ri (whose wall of ice looked like the south face of Aconcagua), 6427m Langshisa Ri and 6387m Ganchenpo – were dramatic. Chyadang was one of those campsites you remember, and wish you could stay a week. 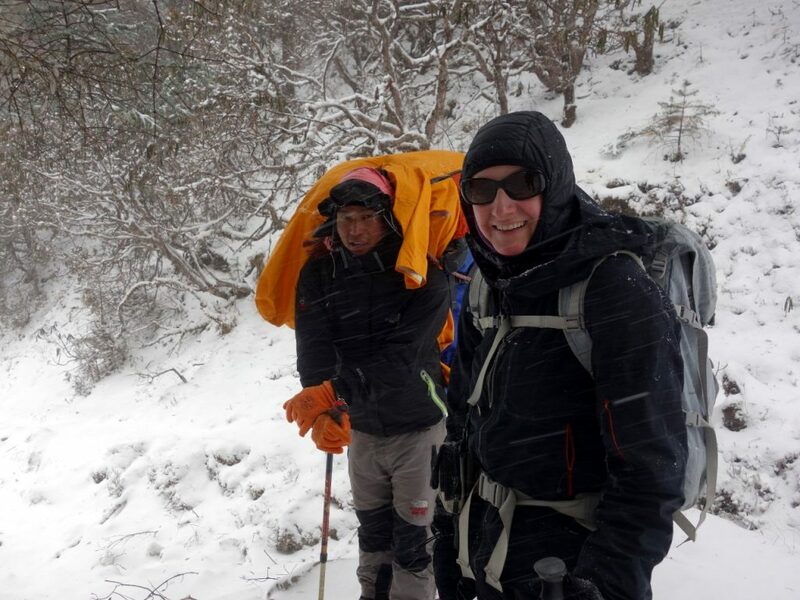 We had a somewhat farcical recce into a side valley, where we hoped to find a lake in a hidden combe and climb a little 5200m peak call Dshabu Ri, but the deep snow turned this plan into an impossible task. Our insistence on continuing to explore new places despite the unfavourable conditions seemed to be trying Gombu’s patience. Frequent setbacks were accompanied by bursts of his manic laughter. Somewhere in the midst of it all Edita suffered a coughing fit so severe that I actually got behind her and started performing the Heimlich Manoeuvre, until she recovered sufficiently to tell me that all she needed was a drink of water. We left our lovely campsite at Chyadang and returned down the Langtang Valley. At last the snow was melting, and below Kjanjin we were back on dry land. I don’t have words to adequately describe what we saw when we returned through the site of old Langtang village, and the area beneath the couloir that acted like a funnel. As a mountaineer I am used to crossing boulder fields. Glaciers have the capacity to carry an awful lot of loose rock and deposit it in a pile. But never had I seen anything like this. Half a mountainside appeared to have broken off and shattered into a million pieces. We crossed a massive area of nothing but giant fragments of broken rock. In the two years since it swept down, not a single blade of grass had taken root. There was nothing there but rock. Somewhere underneath it all there had once been a village, but there was no longer a single shred of evidence. Never in my life have I witnessed such a scene of total devastation. We paused at the far end and looked back. I couldn’t believe what I was seeing. It hardly seemed possible that such a vast area of rock could be thrown down in a matter of seconds. I can’t even begin to imagine what it was like to be caught underneath. That morning we woke up in one of the most beautiful places on earth. A short while later there we were looking across one of the most staggering wastelands. 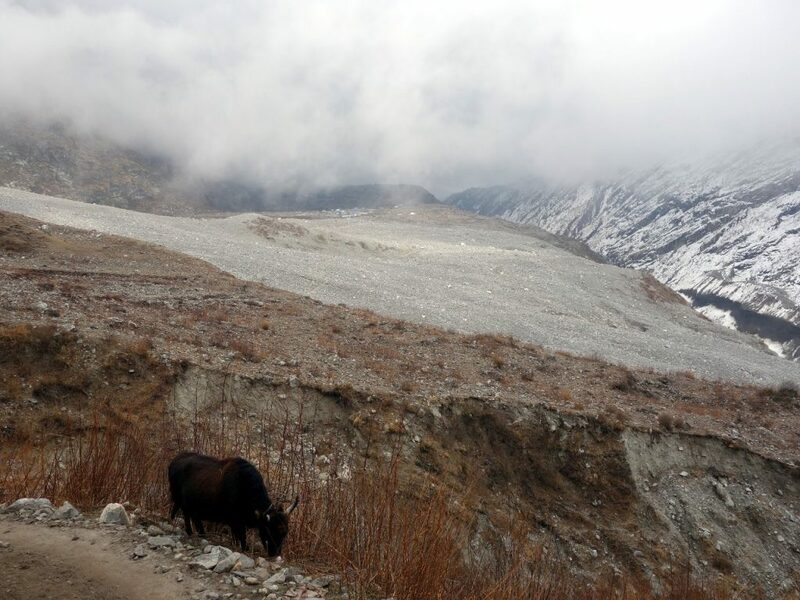 Solitary dzo grazes above the total devastation left behind by the landslide at Langtang. The new village can just be seen across the other side. The devastation didn’t end after we left Langtang. For the next hour and a half I felt like I was passing through a war zone. Destruction was everywhere. Collapsed buildings, concrete pillars, metal rebars lying across the trail. At one point we saw a collapsed suspension bridge, its metal rods twisted into impossible shapes. All of this was hidden under snow when we came this way before. Entire hillsides of trees had been swept over. Looking down into the gorge we saw impromptu timber yards on the shores of the Langtang Khola, where industrious locals were harvesting the devastated forests for timber. We camped that evening at a solitary teahouse in a place called Ghoretabela. The valley was pleasant there, a forested gorge with the river sweeping below. But right above the teahouse was a cliff that had also collapsed in the earthquake. By a miracle the teahouse survived. A few metres above it a huge landslide perched like a pyramid, with giant boulders poised a hair’s breadth above. They balanced so precariously that it seemed like the flick of a finger would send them plummeting. Edita did not sleep well that night, dreaming of earthquakes and the landslide perched above us. But there was a more immediate hazard that we didn’t know about. We were woken at 6.30 by the sound of a sheet of corrugated iron clattering past our tent. There was a woodshed with a tin roof not six feet away from where we slept. It was a windy morning, and a sheet of iron a metre wide and four metres long had been ripped from the roof and landed only centimetres from the door of the tent. Had it come any further it would have sliced through the tent, and us inside. The final two days of our trek were happier, and as pleasing as exploratory trekking could be. Beyond Lama Hotel the main trail keeps to the valley floor on its way back to the roadhead at Syaphru Besi. But we took the high trail, which climbs hundreds of metres above the valley on the north side, passing through the village of Sherpagaon, perching precariously on a hillside. It was a wonderful trail, which climbs out of the deep forest, but is lined with colourful rhododendrons all the way along. There were views across the valley to snowcaps near Gosainkund, where we had trekked more than a week earlier. For our last night in Langtang we wanted to find a pleasant campsite away from the villages on the tourist trail. There was a place called Polche Kharka marked on our map, on the mountainside high above Syaphru Besi. None of our staff had been there, but many of them knew about it by reputation, and they said it was supposed to be a nice place. We asked them to find a local guide who could take us there. The man they recruited at our teahouse in the village of Sukya, 600m below Polche Kharka, was 70 years old, with grey hair and dark glasses. He looked like an aging Nepali rock star, and Edita decided to call him Rocky. He was an entertaining character. When she told him about his nickname he mimed an air guitar with his walking stick. 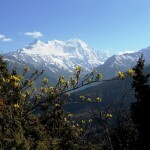 We left Sukya at 8.30 for a pleasant climb through mixed forest of pine, oak and rhododendron. As we were only going for one night we didn’t need much equipment – or all of our porters, but they all decided to come anyway with lighter loads. At about 10.15 we broke into a huge clearing in the forest set on several levels, with a number of abandoned stone buildings. The altitude was 3050m. It was a fantastic elevated setting looking west to the Ganesh Himal, a range of dramatic 7000m peaks that few people get to see. The highest, Ganesh I rises to 7,422m, but it is 6986m Ganesh V that gives the range its name. It was only later I learned that from that angle its grey dome and ridge looks like the head of an elephant and its trunk. The mountain is named after the Hindu god Ganesh, who takes the form of an elephant. It was a breathtaking scene. It had never occurred to me that I would get such exceptional views of Ganesh on this trek, an unexpected bonus, and all because we were unable to climb our peaks and had to change our plans. The Ganesh peaks from above Polche Kharka. Ganesh V in the middle is said to resemble an elephant. The highest, Ganesh I, is on the right. I was reluctant to leave the following morning, and lingered long taking photos. I don’t know if I will ever be there again, but I intend to get closer to Ganesh some day. It’s as picturesque a massif as any I’ve seen in Nepal, but one that is rarely explored. As for the campsite at Polche Kharka, it deserves to be more widely known, and feature on many more trekking itineraries. It could potentially be a jewel in the tourist crown for the villagers in Sukya, and places lower down the valley. It only took us two hours to walk up there from the village, on an ancient forest trail, so it’s also a potential day trip with no requirement to camp. Not much more than two hours after leaving that heavenly place, we had descended 1500m to Syaphru Besi, a small village that has become a small town in the years since my last visit. It’s a bit of a dump, if I’m honest, but it takes only six hours to drive there from Kathmandu. Just north of Syaphru Besi the road has been extended to the Tibetan border, where there is a checkpoint. In theory you can drive from there to China. But we stopped at a teahouse that night and celebrated the end of our trek with a couple of bottles of Tuborg. We hadn’t climbed our peaks, but it had been a trip of contrasts which I thoroughly enjoyed. We made plans for more explorations in Langtang and Helambu, and I’m sure I will return sometime. 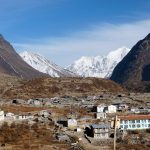 Langtang and its surrounding villages are recovering remarkably quickly from the devastating events of 2015, and it’s now possible to trek there in the same way you could before. The villagers don’t need aid or donations. It’s much better for them to be self-sufficient, and they know this perfectly well. The best way you can help is by paying them a visit. Langtang is a wonderland that became a wasteland, but it will be a wonderland again. ← Reality Check: Will there be a huge clear up of garbage on Everest this year? Good trip and also good presentation.I enjoy it ,as if I also there with you.Nevertheless I will be there soon. Hope all your good post. Thank you Mark, for making this report on Langtang village. I know I am not alone in wondering how the people of Nepal are recovering after the earthquake. The devastation in Langtang was so complete, it just broke our hearts. Thanks for this post, Mark. I have been considering the Langtang trek for my next trip to Nepal and it sounds like it is just what I am looking for. Returned to the Annapurna Circuit with an amazing side trip to Tilicho Lake and saw a lot of the earthquake damage around Kathmandu. Glad to hear that the Langtang area is recovering and hope more tourists take advantage of this. It’s a good idea to take the high trail and cross Sherpagaun. We help the projects of the inhabitants and encourage trekkers to stay in the village. We hope you have good memories. You are so great mark, this information will definitely increase more trekkers and a good help for victims to rebuild their destroyed houses. A very interesting read. I did the Everest Base Camp trek just before the earthquake and again in November of 2015, and although there was localized damage in the Khumbu, it fared much better than the Langtang region obviously. I’m hoping to go to Langtang in the fall of 2019 and your blog was very interesting and helpful with your incites. Thank you.